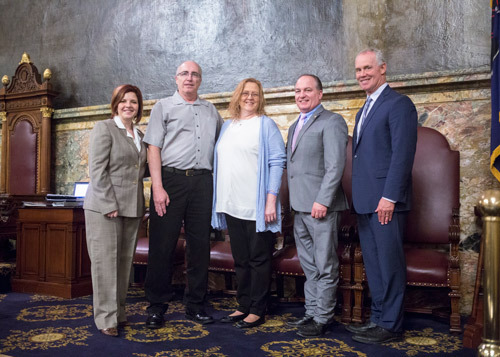 The state House of Representatives honored Rich and Linda Horner of Rimersburg for their long-standing advocacy to increase awareness and prevention of esophageal cancer. In doing so, the House unanimously passed House Resolution 126 on Monday. Rich Horner is an 11-year survivor of the disease. They are pictured with House Majority Whip Kerry Benninghoff (R-Centre/Mifflin), who is chair of the House Cancer Caucus; and Speaker of the House Mike Turzai (R-Allegheny). HARRISBURG – Recognizing April 2019 as “Esophageal Cancer Awareness and Prevention Month” in Pennsylvania, Rep. Donna Oberlander (R-Clarion/Armstrong/Forest) honored Rich and Linda Horner of Rimersburg on Monday for their ongoing efforts to raise awareness about the disease. Esophageal cancer is among the deadliest cancers, and fewer than one in five patients will survive for five years. According to the National Cancer Institute, more than 17,290 individuals are estimated to be diagnosed with esophageal cancer in the United States in 2019, and almost 16,000 will die from the disease. Rich Horner, who at the time suffered from chronic heartburn, was diagnosed with esophageal cancer in 2008. As a survivor, he and his wife, Linda, have been strong advocates for awareness and prevention. One of the most common causes of esophageal cancer is heartburn or gastroesophageal reflux disease (GERD), which is viewed by many sufferers as an acceptable condition of life; and GERD can lead to Barrett’s esophagus, which results in as much as a 125% increase in an individual’s chance of developing esophageal cancer. Esophageal cancer is often not detected and diagnosed until the disease has reached the later stages, and treatment is often radical, is likely to cause complications and involves outcomes which are poor. Recent advances in surgery and critical care have allowed centers of excellence in selected academic hospitals to perform minimally invasive esophagectomy, some robotically, with excellent outcomes, lower risk of death and earlier return to activities of daily living. House Resolution 126 unanimously passed in the House on Monday. To view Oberlander’s comment during House session, click here. For more information on esophageal cancer, the Horners encourage those who suffer from chronic heartburn to visit ecan.org or contact their doctor.